MONROVIA, Jun 25 2014 (IPS) - Mary B owned a shop in West Point, Monrovia’s densely-populated slum community, where she sold liquor just a few yards away from the sea. But last month, the ocean left her homeless and without a business because the devastating erosion of the coastline has resulted in most of the land eroding into the Atlantic Ocean with thousands of homes being washed away by the encroaching sea. “While a human being or your landlord will tell you ‘I give you notice at a particular time’ then you will pack your things and look for another place, the sea can’t give you notice,” the young woman who preferred to be called Mary B told IPS. Situated between the Mesurado and St. Paul Rivers on a peninsula projecting out of the Atlantic Ocean, the township of West Point is home to about 75,000 people living in shacks that are predominantly made out of zinc. Mary B said she had bought the piece of land from the commissioner of the township for 11,500 Liberian dollars, about 130 U.S. dollars, and built her shop on it. According to the Township Commissioner’s office, residents in the area are primarily squatters, with no legal rights to the land, though it is possible to obtain a Squatters Permit from the administrative office, which grants a certain level of legitimacy to the dwellers. But for sometime now, residents of West Point have been hoping that one day they will be relocated because of the continuous environmental degradation on the shoreline here. A report on the threat to the environment in Liberia released by the United States Agency for International Development (USAID) in 2008 states that erosion in this West African country is causing the shoreline to recede in some cities, including Buchanan, Greenville, Harper and Robertsport. Beach mining is also said to be the main contributing factor. Mohamed Carew Alias Kaddafi, 43, is physically challenged and a father of six. A carpenter by trade, he ran a small grocery shop in West Point, which was washed away in the storm. 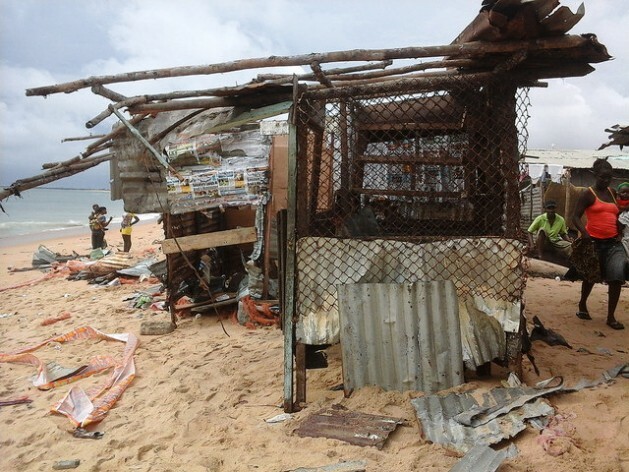 “We were in the shop, the water came with force and blasted the whole place,” he told IPS, adding that this is not the first time he has lost his business to the sea. He may be eager to move elsewhere, but the government has not committed to a relocation plan. West Point is home to many of Monrovia’s disadvantaged people and many cannot afford the city’s huge rents, which are fixed in U.S. dollars — 150 for a modest two bedroom apartment. To make matters worse the government does not have public housing available. People in the area have always talked about plans by the government to relocate them, but the Public Works Ministry says the government has no such plans to move over 75,000 people. However, the government agency responsible for monitoring environmental conditions, the Environmental Protection Agency (EPA), says the erosion in West Point and other communities is something the government is concerned about. “In Liberia, climate change is causing serious coastal erosion and degrading of coastal environment,” Stephen Neufville, acting head of the EPA, told IPS. West Point and other coastal communities in Monrovia are expected to benefit from the second phase of the Coastal Defence Project otherwise known as Enhancing Resilience of Vulnerable Coastal Areas to Climate Change Risks in Liberia. But the EPA says that the start of the next phase of the project, which includes Monrovia, where West Point is situated, “depends on when we get the next funding.” The previous funding, they say, was used for the first phase that is currently ongoing in Buchanan. This project, launched by the United Nations Development Programme and the government of Liberia, is set to help coastal communities in three counties develop defensive mechanism against the effects of climate change that cause sea erosion. The Coastal Defence Project involves building breakwaters to stop waves from eating up the coastline. But many residents fear that this may be happening too slowly and if nothing is done to relocate them from the area, the sea will continue to cause destruction to their lives and properties. “For us in West Point, we call the sea the original landlord,” Mary B said.